As a young student in the 1950s Lucille Iorio, the daughter of Mary Azarian and the granddaughter of Abraham and Lucy Azarian, wrote a brief family history with information supplied by Abraham and Lucy's daughter, Christine Azarian Pace. The following is a transcription of Lucille's written report. He belonged to the Catholic religion.2 In the town, where he lived, they said mass in their native tongue.3 The people would not use the Latin language because they believed that had founded the Catholic religion first. 1 Unfortunately, the fact that Abraham Azarian was tall with red hair is probably NOT true. The only other description of him, his immigration information, says he was 5 foot 3 inches with brown hair. Photographs show him not much taller than his daughters who were not noted for their tallness. 2 Records show that he was married and his children were baptized in the Armenian Catholic Church in Constantinople. 3 Eastern Rite Churches, including Armenian Catholic, Armenian Apostolic, Greek Orthodox, and Russian Orthodox do not say their masses in Latin, but in their mother tongue. 4 The old "descended from royalty" story. Lovely, but most likely not true. Abraham did come from the mountain town of Sivas in Eastern Anatolia, which existed at least as long ago as Roman times when it was known as Sebastia. HOWEVER, the word Pacradouni has been associated with the history of the family. A Google search for Pacradouni/Pakradouni/Bagrasouni Armenia several years ago revealed several sites that give the history of the Pacradouni. However, some of them are no longer up on the web. History of Armenia . Thanks to Ilda Restrepo Pace for this tip. The Pacradouni story is connected to the village of Perkinik where Abram's wife, Lucy Arevian/Hagopian was born. The Armenian Catholic Archbishop, Hovhannes Tcholakian, told Tom and I in May 2008 that the Azarians of the Armenian Catholic congregation in Istanbul were from Pirkinik. 6 The last paragraph is true. All of the known records agree that Abraham's parents were Melkon and Catherine Azarian. In addition, traditional naming patterns reaffirm the names, Melkon and Catherine, as the names of his parents. His first daughter was named Catherine and his first and only son was named Melcon. The place of Abraham's birth and his age are taken from the information he supplied on his immigration in 1920. His death record listed him at age 80 in 1941, which would mean he was born 1861. Sebastia, AKA Sepastia and Sevastia, is known in modern Turkey as Sivas. Sivas is both a Turkish villayet (province) a sanjak (a subdivision or state of a villayet) and a city in eastern Anatolia. The town of Sivas is located at 4,183 ft above sea level on the north side of the Kizil (Red) (Kizilamk) River. The climate in the area includes, short hot summers and long, cold and "harsh' winters. Rain and snowfall are minimal and the resulting dry climate causes the area to be predominately steppe or prairie vegetation. "In the sanjak of Sivas, there were approximately twenty- six Armenia villages, the local peasants being engaged in agriculture and handicrafts. In the town, the Armenians were the merchants, traders, and artisans but were also involved in money changing and money lending and most of the rather extensive trade of the province was in their hands." " Altogether the city contained 30 mosques. The Apostolic Armenians possessed four churches, the cathedral built in 1840 being the largest. There were also an Armenian Catholic church, a Catholic chapel attached to the Jesuit mission, and a single Greek Orthodox church." "There was a Roman Catholic "college" in Sivas, and the city possessed an American mission hospital." Hewsen quotes the Viscount Bryce, 1916. "This province is less mountainous and much richer than its eastern neighbors. Agriculture is flourishing, the nomad shepherd is comparatively rare, and there are a number of populous towns with the beginnings of local Manufacture. " This area of Turkey is a semi-arid intermountain plateau with few trees, hot summers, and cold harsh winters. Family stories, as told to me by Alice Azarian Blanck and to George Parnegian by his mother, Catherine Azarian Parnegian, relate that Abraham and Lucy eloped to Constantinople because Abraham was supposed to go into the priesthood and their families did not approve of their union. While it makes a very romantic story, I am skeptical. Given the strict cultural isolation of the women in that part of the world at the time of their marriage, elopement all the way from Sivas to Constantinople would have been out of the question. Furthermore I believe that they were both living in Constantinople at the time of their marriage. The clincher, is that they were married by a bishop. It seems highly unlikely that the bishop would have married a nineteen or twenty year old woman without her parents permission. Therefore, I believe that their marriage was fully approved by their parents (or at least hers). Stories of romance are very common in all societies. My Irish great grandmother and great grandfather were supposed to have met on the ship coming over from Ireland. The only problem is that she immigrated in 1890 and he immigrated in 1894. The records indicate that there were Azarians living in Constantinople in the 1830s and Hagopians and Arevians by the 1890s. It is my understanding, however, that Azarian is a common Armenian name, so it is possible that some of these Azarians in Constantinople were not related. There are indications that Abraham was living in Constantinople by 1890. It is highly likely, given the customs of the time, that the marriage between Abraham and Lucy was arranged. It is also possible that Lucy was a relative of Abraham's mother. Both Abraham's mother's maiden name and Lucy's maiden name have been listed as Hagopian. Abraham Azarian, the son of Melkoni (Melkon) Azarian, married Ezisabet Hagopian, daughter of Hagovpas (Hagop) Hagopian, on May 25, 1895. The marriage was performed by Bishop Abigian. The witness was, Matos Dezetsian, place of residence, Ho Prgiz. The marriage record was taken from LDS microfilm # 1037106, records for Surp Savour, Armenian Catholic Church, Beyoghle, Constantinople, Turkey. Clearly, either Abraham or Lucy had connections, since they were married by the bishop. Ezisabet would transliterate as Elizabeth. In all other records she was known as either Lucy or some variation of Lucy. There is no question that this is the correct record as the records for the Armenian Catholic Churches in Constantinople are very limited. If Lucy's date of birth as listed on her immigration record and her death record are correct, it would mean she was close to 20 years old at the time of her marriage. This strikes me as on the "oldish" side for a first marriage in the culture of the time and place. The slightly older age at marriage may reflect European influences on the family. Gadarine Azarian, the daughter of Abraham Azarian and Lousia Hagopian, born October 3, 1896, Galatia, priest, Bishop Abigian, godfather, Avitis Hagopian, church------, baptized October 6, 1896. LDS film #1037106, Surp Savour, Beyoghle, Istanbul. Anna Arevian, the daughter of Batist Arevian, in 1909. Kristine Azarian, the daughter of Abraham Azarian and "Liousi" Arevian, born March 8, 1899, baptized on March 28, 1899, priest, Bishop Gomitas, godfather, Avitis Hagopian. LDS film #1037106, Holy Trinity Church, Beyoghle, Istanbul. The records that include the baptism of Christine are a little odd, in that there are two sets of records for this church. Both include the baptism of Christine in 1899 and contain the same information which does not include the place of residence. Family history says that Lucy had a sister named Christine. "Milkon" Azarian, the son of Abraham Azarian and Lousia Hagopian, of Galatia, born March 1, 1901, baptized on March 17, 1901, priest, Father Nourijian, godfather, Stepan Gougoujian place of residence, Ho Prgiz. LDS film #1037106, Surp Savour, Beyoghle, Istanbul. Melkon was named for Abraham's father. Gouchujian was the maiden name of Batist Arevian's wife, Elizabeth. Zabel Azarian, the daughter of Abraham Azarian and Louzia Arevian, born ---4, 1903, baptized, October 5, 1903, priest Haroutini -----, godfather, Martiz Margosian. LDS film #1037108, Church of Surp Ohannes, Vosgeperan, Taksim, Istanbul. Zabel must have died as a child because Zabel (Alice) was born in 1915. I could not find the death record. Who was Zabel named for? None of the siblings of either Abraham or Lucy were listed in the family history as being named Zabel. Ermina Marta Azarian, the daughter of Apraham Melcon Jacob Azarian and Louzia Arevian, born September 15, 1905, baptized on December 4, 1905, Priest------, godfather, Anton Aslanian. LDS microfilm #1037108, Surp Ohannes, Vosgeperan, Taksim, Istanbul. There were no other Azarian, Arevian or Hagopian baptisms recorded in Surp Ohannes. None of the siblings of either Abraham of Lucy were listed in the family history as being named Ermine. Anna Azarian, the daughter of Abraham Azarian and Lousia Hagopian, Galatia, born March 25, 1908, baptized May 18, 1908, priest, Ekmekjian, godfather, Tibalti Arevian, place of residence, Ho Prgiz. LDS microfilm #1037106, Surp Savour, Beyoghle, Istanbul. L'Archeveche Armenien Catholique d'Istanbul declare et certifie que Anna (Annik) Azarian, fille des epoux legitimes Abraham Azarian et Lucie (Nee Agopian), est nee a Galata (Istanbul) le 25 Mars 1908 et qu'ell e ete baptizee et confirmee, selon le reit Armenien Catholique le 18 Mai de la meme annee par Monsiur l'Abbe Raphael Ekmekdjian en eglise paroissiale du Saint Sauveur a Galata, ayant eu pour parrain Monsieur Stepan (Etienne) Tibaldi. En foi de quoi le present certificat e (can't read two words) pour servir et valoir ce que de droit. "Certificate of birth and baptism. The archives of the Armenian Catholic Church of Istanbul declares and certifies that Anna (Annik) Azarian the legitimate daughter of Abraham Azarian and Lucie nee Agopian, was born at Galatia (Istanbul) on March 25, 1908 and was baptized and confirmed according to the Armenian Catholic rite on May 18 of the same year by the Abbot Raphael Ekmekdjian in the parish church of Saint Savior at Galatia and her godfather was Stepan (Etienne) Tibaldi. This certificate will serve as proof. The godfather's name in the church records was given as Tibalti Arevian and in the 1969 certificate as Stepan (Etienne) Tibaldi. Mary AKA Hephine and Helen. Heghine Miriam Arevian Azarian, the daughter of Abraham Azarian and "Linsi" Hagopian, born September 22, 1910, baptized on ----21 1910, priest "Ekmikjian", godfather, Batist Arevian, place of residence, Chechtik (?) Galatia". LDS film #1037106, Surp Savour, Vosgeperan, Taksim, Istanbul. Family history says that Abraham had a sisters named both Mary and Heghine. Eranin Zabel Azarian, the daughter of Abraham Azarian and Lousia Hagopian born December 9, 1914, baptized on December 27, 1914, priest, Jakob Mazarian, Godfather, Haroutias Azarian, residence Galatia (there are two other words written here that I don't understand). LDS film #1037106, Surp Savour, Vosgeperan, Taksim, Istanbul. Alice told me that her name was changed by her school teacher. Mgr Etienne Pierre X. Azarian,. Patriarche de Cilicie. Azarian (Ant. ), banquier, Grande Rue de Pera, 107. Azarian (Aristakes p.226 (3) AZAR - page 226 Azarian (Stepan), broderies, Kezabdjioflou. Han, 24, S. Azarian (Vit. ), miroitier, Kurkdji Han, 11, 19, S. Azarian (Vit. ), marchand, R. Djelel, 7, P.
Azarian Pere et Fils, et negociants, R. Perchembe Bazar, 22, G.
Azarian (St.), Kezapdjioglou Han, 24, S.
Azarian (G.), employe a la banque ott. Azarian (Bedros). Avocats : Ismail Hakki Effendi. 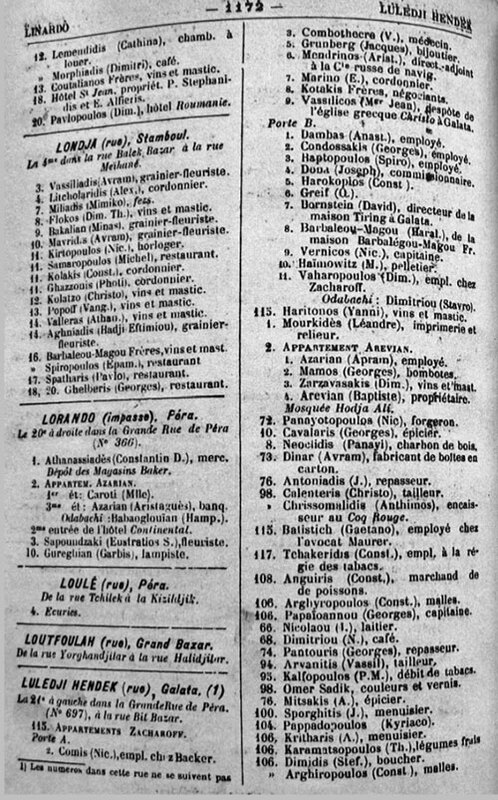 In July 2012 Catherine Saiko graciously sent me a copy of two pages of the Annuaire Oriental 1895 which contained the following listings for the name AZARIAN. Azarian (Aristakes Effendi), de la maison Azarian Pere et Fils, president de la chambre de commerce de Constantinople.- Dom: a Bouyoukdere. Azarian (Bog.) bijoutier [jeweler], Zindjirli Han 6, s.
Azarian (Jos. ), de la maison Azarian Pere et Fils, R. Arslan 15, P.
Azarian (M.) forgeron [smith], R. Calafat -yere 85, G.
Azarian (Mgr Etienne) catolicos de Cilicie, patriarche des armeniens catholiques, R. Sakyz Agatch, P.
Azarian Pere et Fils banquiers et negociants; fondes de pouvoirs de la Cle d'assurance Alliance (Voir) annonce page 1315). Maison fondee en 1835 par Ohannes Azarian sous la firme actuelle. Proprietaires actuels Aristakes Azarian et Joseph fils de Ohannes Azarian, Bedros A et Joseph A. fils de Aristakes Azarian president de la chambre de commerce de Constantinople depuis sa fondation R. Perchembe Bazar, 22. G.
Azarian (Step), [designer], Djedid yarem Ilan 23, S.
Azarian (Vit.) miroitier [glazier], Kurkdji Han 11, 19 et R Mahmoud Pacha 95. S. Com: R. Pancaldi 199 Pera. He was listed as retired in the 1914 Annuaire Oriental. In July 2012 Catherine Saiko graciously sent me a copy of two pages of the Annuaire Oriental 1914 which contained the following listings for the name AZARIAN. Azarian et Cie, negociants, Bouyonk Achir Effedni Han, 28, P.
Azarian (Aristagues), banquier, Imp. Lorando, 2, P.
Azarian (Azarik), negociant, R. Elma-Dagh, 10, Panc. Azarian (Boghos), joaillier, R. Gul-Soudjou, 11 S.
Azarian, (Carnik), chef de section a la division de la comptabilite centreal de la dette publique --tomane, R Avanos, 9, P.
Azarian (Garabad), tailleur, R. Tchailar, 13, P.
Azarian (G.) commissionnaire, Whittal Ban. 10, S. Dom: R Pancaldi, 201, appart. Azarian, 3. Azarian (Gregoire), rentier, R. Nicahn-Tache 9, P.
Azarian (Hratchie), mercier, R. Tachailac 84, P.
Azarian (Joseph A. ), banquier, Boul, Ayaz Pacha, 77, P.
Azarian Pere et Fils ---, banquiers et negociants, fondes de pouvoirs de la Cie d'assurances Alliance, Maison fondee en 1835, R. Perchembe Bazar, 22, G.
Azarian (Stephan) , Djedid Yaren Han, 26, S.
Numbers 1., 3., 13. and 15. are related to the Azarian Brothers, the sons of Hovhannes Jean Azarian (1795-1864) and Anna Kovhovmjian (Kouyouomdjian) (1801-1896) from Perkenik. Numbers 5., 6. and possibly 16. have the Elma Dagh address in common. Numbers 10. and 18. have an address in common. "The senator" was Mr. Manouk AZARIAN. See Gregor and Manouk Azarian above. Apram Azarian is my husband's grandfather. 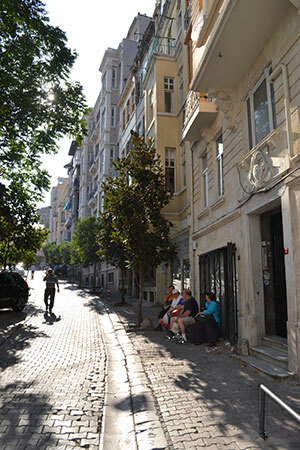 Catherine Saiko also sent me a copy of the page showing the inhabitants of Luleji Hendek Street in Galata. Zarzavasakis (Dim), vins et mast. 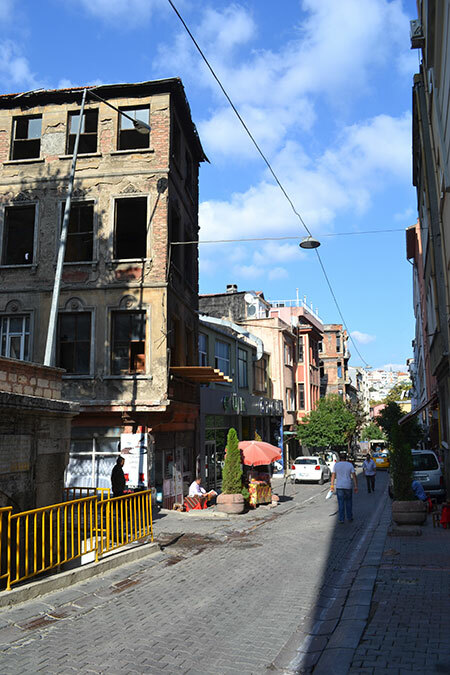 Apparently apartment living in Turkey was a relatively new concept in the mid to late 1800s. It was considered more modern and more western. 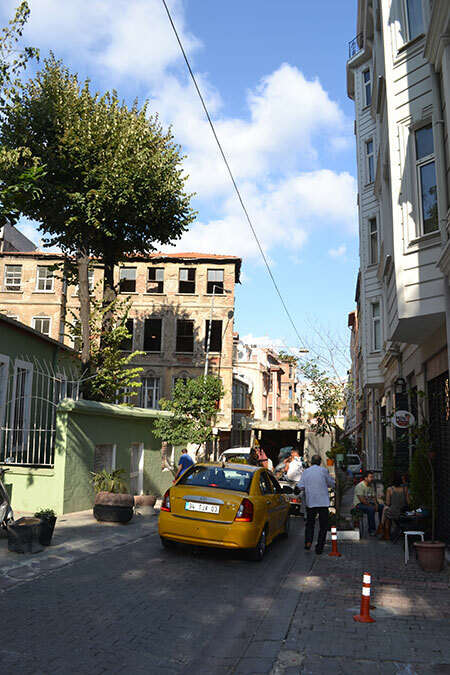 Most of the residents in the new apartments buildings around the Galata tower were in the high or middle high income strada. 1920/21 Maison du Marin, rue Luledji-Hendek, pres de la Tour - Galata, est un Cercle pour les matrins et soldats cantonnes a Constantinople. 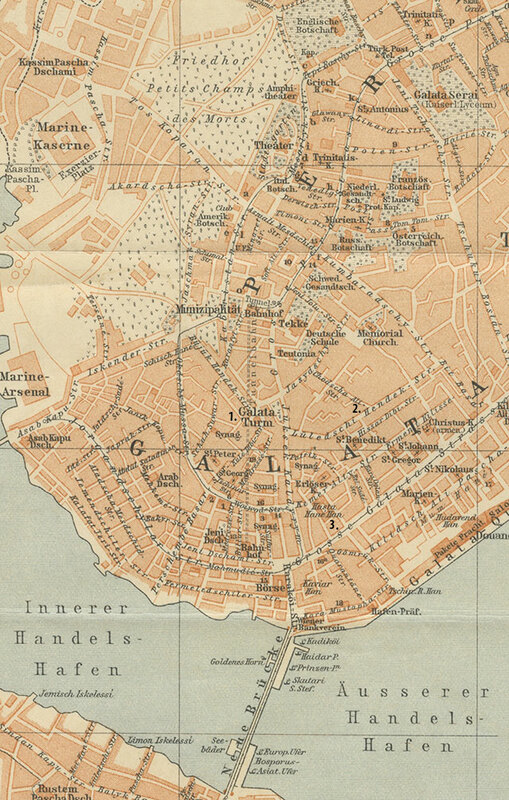 (Bulletin du Diocese de Reims 1920) At the Marin House rue Luledji-Hendek near the tower a circle for sailors and soldiers stationed in Constantinople. The occupations of people on Luledji Hendik in 1914 included: employees, jeweler, director adjunct at the Red cross, shoemaker, several merchants, ?? at the greek school Christo in Galata, commissioner, director of the Tiring house in Galata, ?? of the Barbalegou-Magou house, captain, furrier, wines & mastic, printer & book binder, smith, grocery, charcoal maker, can & carton maker, repasseur, tailor, collector at the Coq Rouge, employee of the lawyer Maurer, fish merchant, employee of the state tobacco, trunks, another captain, dairy (milk shop? ), cafe, another repasseur, another tailor, another tobacco related job, painter & varnisher, another grocer, 2 carpenters, vegetables & fruit vender and a butcher. The majority of the names were Greek. Several were possibly Jewish. The only Armenian names were Azarian and Arevian (they were related to one another). I do not know when the Azerians moved to Rue Luledji Hendik or how long they stayed there. Mary (born in 1910 and Zabel (Alice) were baptized at a church in Taxim, a distance form Rue Luledji Handek. When Mike Azarian emigrated in February 1020 he listed his relative in Constantinople as Batiste Arevian 71 Havier Han. 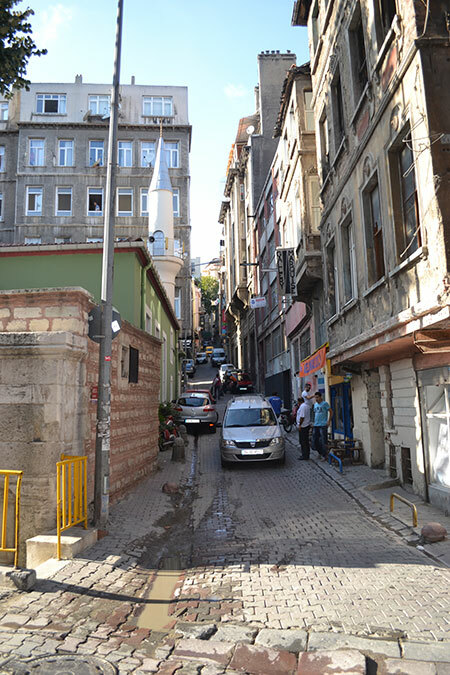 The green building on the right is the Ali Hoca Mosque. 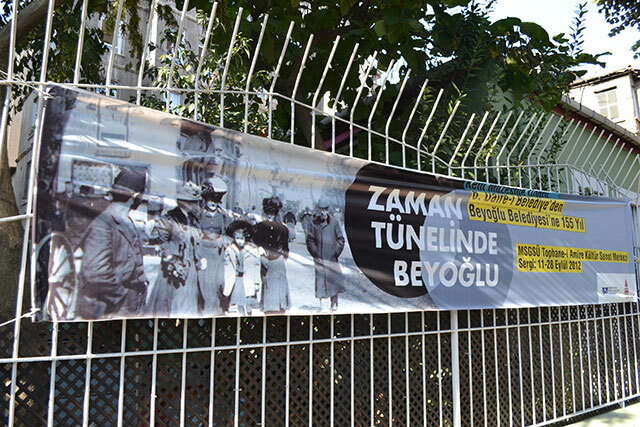 The banner is an ad for the City Museum in commemoration of the opening of the Beyoglu Tunnel and 155 years of the Beyoglu community. The green building is the Ali Hoca Mosque. 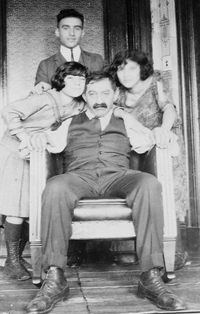 Abraam Azarian a 55-year-old, married, worker from Constantinople and his daughter, Eftek, age 15 years, scholar, arrived in New York on October 26, 1920 on the S.S. Pannonia from Piraeus, Greece. They were listed as having paid their own passage. Abraam listed his next of kin in Turkey as his wife, "Soutnik Asarian" of Galatia, Constantinople. Relative or friend in the US was his "brother in law" Artin Sermergian at 245 30th St. New York. They are both listed as able to read and write Armenian. Abraam was listed as 5ft. 3in. tall, brown hair and brown eyes, in good health. His place of place of birth was listed as Sebastia, Turkey. Eftek's height was listed as 5ft. 2in. tall, brown hair and brown eyes, in good health. Her place of birth was listed as Sebastia, Turkey. There was a notation "spec exam" over the entry for Abram. This information is taken from the manifest of the S.S. Pannonia available at the National Archives Records Administration, NYC Branch. Who was born in Sivas? Sivas was more than 500 miles from Constantinople over mountainous terrain. It is an established fact that Eftik, Annik, Heghine, and Zabel were baptized in Constantinople. It is hard to believe that they would have been born in Sivas and baptized in Constantinople. Clearly they must have been born in Constantinople. Technically, this puts into question whether Abraham was born in Sivas. There may not be any way to resolve that question definitively, since there are no remaining records for the Armenian churches in Anatolia. It is clear that Abraham and Lucy had strong ties to Sivas, and it is highly likely that Abraham was born there. There is the possibility that they listed Sivas as a place of birth for immigration reasons. Before the First World Was immigration policy into the United States had been fairly lenient. However, things tightened up around 1920/21 when there was a big influx of refuges from countries that had been affected by the war. Before the war, no documents were necessary for immigration. After the war various documents were required. While there had always been a trickle of Armenian immigration to the United States, it increased dramatically after the atrocities in 1900-1915. Post war Armenian immigration was very high. In 1921 the United States government instituted an immigration quota of three percent a year for each nationality. Lucy and her daughter, Anna, Mary and Alice arrived in May of 1921, after the quota had been established. Immigration to the United States virtually closed to Armenians by 1924. I do not really know what the situation for the Armenian population in Constantinople was during the genocide and WWI. However, the real atrocities occurred in the Armenian communities in Anatolia. Sivas and Harput were towns from which the Armenian population had been rounded up by the Turks and marched into the desert. It may have been easier to get the necessary immigration documents coming from Sivas than coming from Constantinople. Abraham and Lucy obviously communicated with people in Sivas. 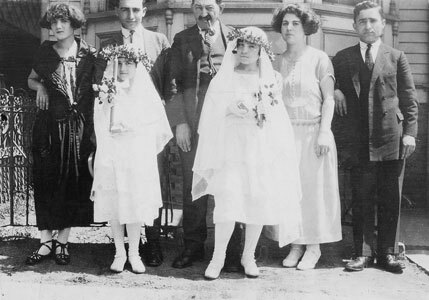 In 1920, their daughter Eftik (Virginia) had an arranged marriage with Harry Semerjian an Armenian from Sivas who had been living in New York for eleven years. Abraham Azarian in the 1929 Directory in Union City, N. J.
Bronx, Azarian, Abraham age 80 widowed, father, born Turkey no occupation. No of household in order 82 C, page 18. He should have been listed with Melcon and his wife but was added on a separate page. Page 7, house hold no 82, 825 Eagle Ave Bronx, Azarian, Melco, head, age 34, born Turkey, salesman, dry cleaners, Vera, age 29, born Massachusetts, Methune, right next to St Ann's Ave Church (maybe St Peter and Paul), near 3rd Ave.
Abraham Azarian died on May 6, 1941 of post-operative broncho-pneumonia. The operation was for a prostatectomy for a hypertrophies prostate. He was in Lincoln Hospital in the Bronx for 18 days prior to death. Addition information: usual address, 825 Eagle Avenue Bronx, length of residence in NYC, 10 years, age 80, widowed, parents, Melcon Azarian and Catherine Hagopian, both parents born in Turkey, profession, none. The information was provided by his son, Melkon Azarian. Abraham was buried on May 9, 1941 at Grove Church Cemetery in North Bergen, New Jersey. Funeral Director: NY Funeral Service Co. 148 E 7; 4th St. Permit Number 2383. The above information was taken from the death certificate of Abraham Azarian, filed in the Borough of the Bronx, and available on microfilm from the New York City Archives, certificate #4509. His parent's names, as listed on the death certificate, were the same as Abraham supplied for the names of Lucy's parents on her death certificate in 1923. No will listed by the New Jersey State Archives, August 2008. 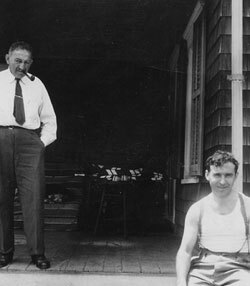 Louie Claveloux told me that Abram and his son, Mike Azarian, had dry cleaning businesses in New York somewhere (either the Bronx or Manhattan). Avo Azarian is the only marriage listed for the name in the Bronx (1931 cert #4612). There is no apparent relationship to Abram and family. Unfortunately this photo is out of focus, making it hard to see most of the faces clearly. 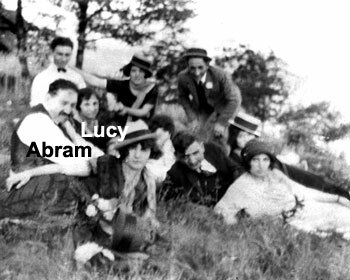 It is the only known photo of Abram and Lucy together. Lucy is seated next to Abram. The other people are not known. The location is not known. Collection of Lucille Iorio Gaudelli. Again parts of this photo is out of focus, making it difficult to be certain who the two girls are. The men are clearly Mike and Abram. The girls are probably Alice and Mary. Collection of Lucille Ioio Gaudelli. Mary and Alice's Communion. Mary and Alice made their communion at St Anthony's in Union City on January 22, 1924. Lucy And Abraham Azarian were buried in Grove Church Cemetery, North Bergen, New Jersey, Section 9, Row T, Grave 21. There is no marker. 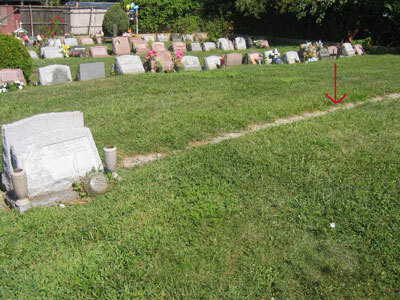 The red arrow marks the approximate grave site. Alice Azarian Blanck gave this medal to her son, Tom. She told him that the medal was given to Abraham Azarian in commemoration of a rescue from drowning of the son of an important Turkish official. 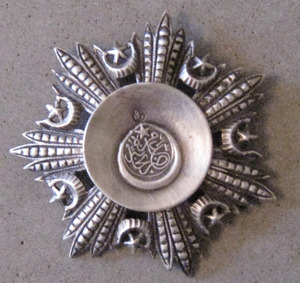 The medal is a Mejidie Order. Mejidie Order (Mecidi Nishani) - Established in 1852 by Sultan Abdulmejid I, this order became the quintessential decoration of the Ottoman Empire. The order came in five classes, with the highest class limited to 50 members, and the lowest class limited to 6,000. This limitation did not apply to foreign recipients, however, and many examples were awarded to foreign diplomats, heads of state, and British, French, and German military personnel.The Mejidie order could be awarded to women. Most of the medals and orders issued by the Ottoman government were struck at the "Darphane Amire" or National Mint in Istanbul. Although medals did not carry the mint's mark, most orders produced in the last 20 to 30 years of the Ottoman Empire carry a mint mark. One exception is the Osmanie Order badge, which is enameled on both sides, but breast stars of the order usually bear the mark on the reverse. The image below shows the circular mark, with the words "Darphane Amire" contained in a crescent. Just above the mint mark is a smaller mark, which is a silver hallmark that is occasionally found on Ottoman orders. This smaller mark is merely a circular cartouche with the word "Sah" (Pure)." The impression at the ceter of the above medal is of the "Darphane Amire" or National Mint Istanbul seal.